Those politically incorrect and extremely entertaining "Chasers" team have once again landed on DVD which features 11 episodes from Season 2 and stars the extremely talented Andrew Hansen, Chas Licciardello, Julian Morrow, Craig Reucassel and Chris Taylor who challenge the current media status quo. So who exactly are the "Chasers"? These five men basically take the "Mickey" out of anything that appears in the media from politicians to celebrities and even commercials to current affairs hosts. The "Chasers" broke headlines all across the globe last year when Julian Morrow (dressed as a Canadian official) and Chas Licciardello (dressed as Osama Bin Laden) managed to make their way through a variety of checkpoints at the 2007 Apec meeting in Sydney. Other entertaining moments in Season 2 feature "Life is a Musical" where the team sing and dance their way through the streets and also giving advice to a variety of politicians in the 2007 Australian elections. 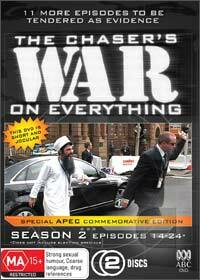 In conclusion, The Chaser's War on Everything Season 2 is a thoroughly entertaining experience that we would not recommend to those right wing or those easily offended by politically incorrect humour... however for everyone else, a must have DVD!